Imagine a multiverse of infinite possibilities. Travel down one thread and find a universe in which Gesture is the main tank for the NYXL or tug at another where Architect and Geguri are teammates. This is a multiverse where the Overwatch League casters have become the players and the players the casters. But you don’t need to have dimension hopping powers to visit this world, it already exists. All you had to do is watch the Overwatch League All-Star weekend. Long after the playoffs finished and the Grand Finals ended came the All-Star weekend, the last event on the League calendar before the long and much needed break before Season 2. The All-Star weekend was a celebration of Overwatch — the game itself, the community, the players, and the many talented individuals that made the past season special. But more than that, the All-Star weekend was about having fun. Festivities began long before the games themselves with a vote for who would represent the two regions: Atlantic and Pacific. Fans voted on the starting six players while players and coaches voted on who would fill out the rest of the squad. The result is a cross section of talent and favorites from across the League. And it all concluded with a traditional game of Overwatch played by the two All-Star division teams. The first day of festivities began with a 3v3 Lucioball tournament, a fitting supplement to the Summer Games event going on right now. 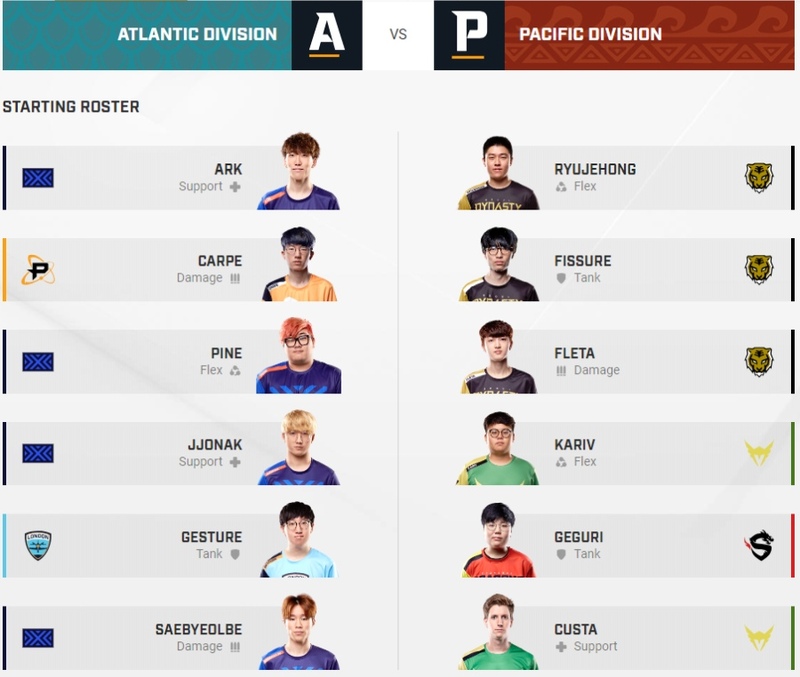 Geguri, Fate and Fissure played for the Pacific Division (and kudos to the production team for getting Fissure a jersey updated with his new team affiliation) while Ark, Poko, and Meko represented the Atlantic. For a bunch of non Lucio players — ArK notwithstanding — the two teams handled the hero well. They boosted, booped, and break-danced across the arena in a game mode that probably annoys the lawyers over at Rocket League developer Psyonix. The match was hotly contested and extremely close. The two teams traded wins before the Atlantic division snatched victory with a last minute goal in the third and final set. Winning, though, didn’t seem important to the two teams. Poko admitted he never played Lucioball, not even in practice, while Fissure was pleased his skill made him look like an Overwatch version of Cristiano Ronaldo. Fun, not winning, set the tone for the match, something that would spill over into every other event until it became more important the the events themselves. Yes, Overwatch League players possess incredible skill and talent that seem to transcend human ability and defy logic. How else can you describe how Sayaplayer clicks heads or how Neptuno knows how to use that Mercy pistol with deadly efficiency. In competitive mode they are the masters of their craft, but if you’ve ever wondered how they would fare in Quick Play like the rest of us Bronze plebs, this match was your chance. Once the deaths started rolling in, team compositions got a little crazy. Teams had two Reapers, two Reinhardts, no healers, and — gloriously — a wealth of Symmetra and Torbjorn play. Again, the Atlantic division pulled off an easy victory, with their Pacific rivals barely able to score a point. Throughout the season, some of the best, game-changing plays have come out the barrel of Widowmaker’s sniper rifle. Her value as a tempo changer is unmatched and she enjoys one of the highest pick rates in the League. Imagine then, the opportunity to see the best Widowmakers in the League face off against each other without the background noise of a teamfight. The rules of the Widowmaker 1v1 were simple. Players competed on one of the three elimination maps, Widow’s autofire was disabled, and only headshots could kill. The Widows were seeded into a bracket, until it came down to the best in the west versus the beast in the east. The winner was not who you’d expect in a Widowmaker tournament. For most of the League, the sniper that struck fear into the hearts of everyone was Pine, Carpe, or Sayaplayer. All three of these players were eliminated. The winner? Surefour. He’s a good sniper for sure (ha!) but not known for his flashy plays like Pine or unrelenting ruthlessness like Carpe. But he was the Widowmaker that won the day, even while committing errors like this one. The buzz surrounding the Talent Takedown generated more hype than the All-Star weekend itself, a chance to see the casters put their money where their mouths were and see if they could put into practice what they so often preached from behind the analyst desk. For weeks leading up to the event, the casters, analysts, and hosts traded good natured smack talk across Twitter, trashing their colleagues’ skill at the game. And while the casters were playing, the players got to cast. Mickie and Agilities took spots on the analyst desk while Custa and Bischu tested their shoutcasting chops in the booth. In the end though, nobody should give up their day job. Especially MonteCristo. While giving fans and players the chance to enjoy some no-pressure Overwatch, the All-Star weekend also offered a chance to reflect on the past season and the player that made the most impact on their team and community. The MVP award goes to the player with the technical skill, the playmaker, but the Dennis Hawelka award is for that special player who’s skills manifest off the stage. Created in memory of Dennis “Internethulk” Hawelka, captain of Team EnVyUs, the progenitor of the Dallas Fuel, this award is voted on by players and coaches and given to the player who’s made the most positive impact on their team and their community. It comes as no surprise then that the first recipient of the Dennis Hawelka award was given to his teammate Mickie. 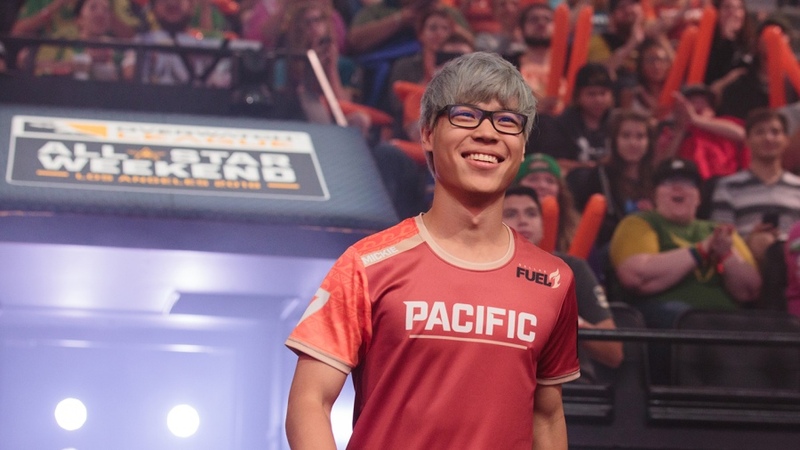 Since the beginning, Mickie has been the smilingest, happiest, and funniest player to watch. He’s always grinning and always showing off for the camera. Watching Mickie, you’d never believe he’s had a bad day. And even when his team had a bad day (and this is the Dallas Fuel we are talking about, they had a lot of bad days) Mickie made sure to put that positive energy to work to lift them out of it. It was going to be really hard to top the antics of the Talent Takedown or the sweet, if surprising, victory for Surefour in the Widowmaker 1v1. But somehow the All-Star game did it. We thought we were going to get a good-old fashioned game of Overwatch played by teams that belong on a Fantasy Overwatch League draft, and for the very first map, we did. The two teams played standard compositions and played as they would any League game. Compositions started devolving into something you’d see in Quick Play until they became almost incomprehensible from a strategic standpoint. Probably because there was no strategy. These players cut loose. 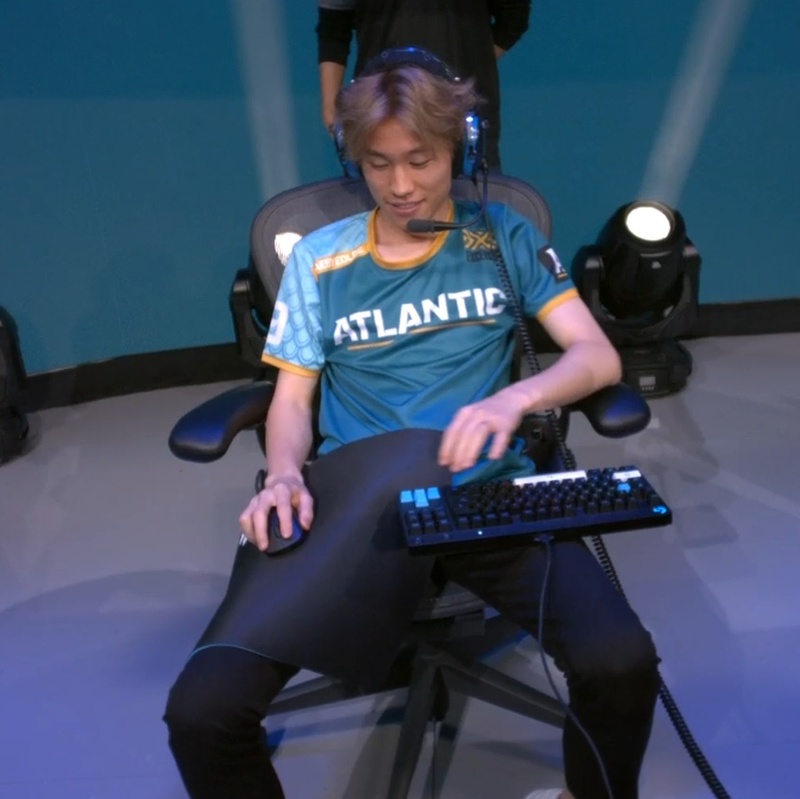 At one part during the match, Saebyeolbe — in a moment of pure fanservice — took his mouse and his keyboard and played out of his lap. Support players were main tanking, players known for their Widowmakers were trying their sniping skills on Ana, and, after a season of teasing, Muma finally got to play Symmetra on the main stage. This match was like deliberate mystery heroes, with every player choosing which crazy combination of heroes to play next. It didn’t matter the Atlantic Division won. Everybody stopped paying attention to the score long before, more focused on the smiles on these player’s faces. The All-Star weekend was the perfect capstone to an incredible year of Overwatch. While it was set up like a competition between Atlantic and Pacific, the only thing that mattered was seeing how much fun those players were having. The League was notoriously brutal, the grueling schedules and immense pressure contributing to player blowups, burnouts, and dropouts. Seeing these professionals play like someone queuing into Quick Play was cathartic. We knew the hardships they suffered, so seeing them on stage all smiles and laughs was healing. It reminds us that Overwatch should always be like this, players should always feel this way. At the end of the day, yes every map matters and we all want to win, but we should never forget to have fun too. It will be five months until the League returns. 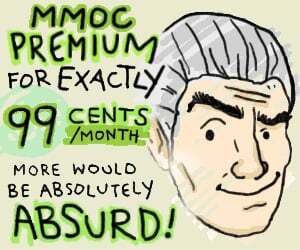 That’s a long time to go without Overwatch but the good news is you don’t have to. Contenders Season 3 should be resuming soon and Open Division Season 3 is happening right now. The World Cup resumes with the Los Angeles stage on September 7th and concludes with the Grand Finals at Blizzcon in November. The Overwatch League is officially in the off season, but there’s plenty more to come. See you in January. Ash, the first of her name, keeper of Zenyatta lore, protector of Hanzo mains and Mother of Shanghai Dragons, is a content writer for the Overwatch section of MMO-C and Gamepedia. The Talent Takedown was the absolute highlight of the weekend. Only allowing headshots for the Widow 1v1 was quite stupid. Why is that? It's a popular game mode on live servers, so of course they used the same settings.